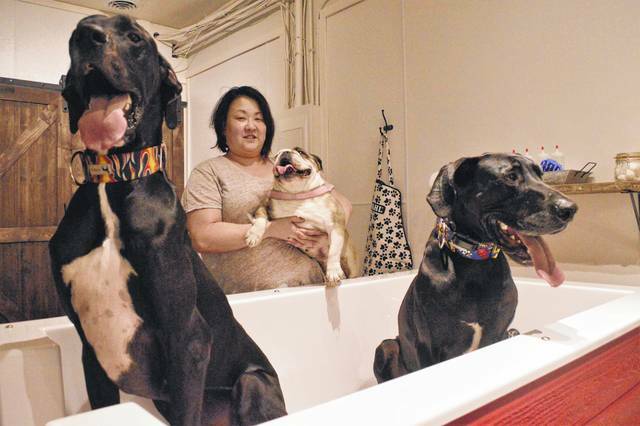 Kimberly Zoob, the owner of Real Big Puppy, 28B S. Sandusky St., shows the size of one of the boutique’s wash tubs with her two Great Danes, Oakley and Mason, while holding her English bulldog, Sophie. The store provides retail products and two self-wash tubs for dogs up to 200 pounds. 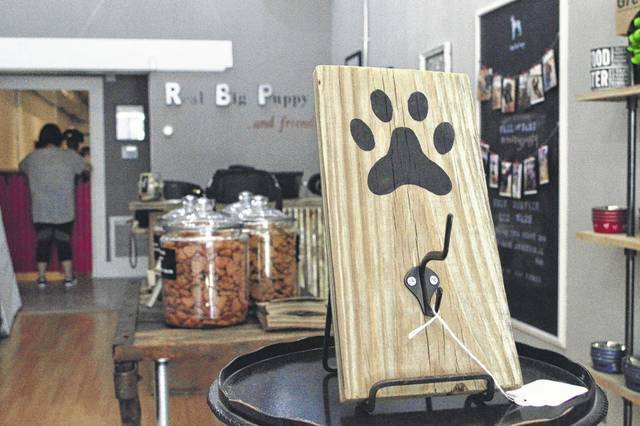 The retail section of Real Big Puppy, 28B S. Sandusky St., provides collars, toys, food, and beds for dogs. Kimberly Zoob can now take her three dogs to work almost any day of the week. She can also give them a bath, if needed, without leaving the office. And other large dog owners can do the same at Zoob’s downtown boutique, Real Big Puppy, since it opened for First Friday this month. The new business is located at 28B S. Sandusky St.
“The community has been awesome,” Zoob said. The estimated 1,300-square-foot location features a retail section in the front and a self-service dog wash in the back. The retail portion will have collars, toys, food, and beds for dogs up to 200 pounds. And the wash room has two tubs delivered from the west coast to provide convenience for owners of dogs that are too large for the bathtub at home. The boutique will provide towels and handle the cleanup, something customers have enjoyed, Zoob said. The native New Yorker’s family relocated to central Ohio about four years ago after Zoob’s husband, Bill Gropper, was offered a job with Limited Brands in Columbus. Zoob, a corporate attorney by trade, spent more time with their now 11-year-old daughter, Abigail Gropper. Since November 2014, the transplanted New Yorkers have owned two rescued Great Danes named after former NBA players Anthony Mason and Charles Oakley from their favorite basketball team, the New York Knicks. Zoob also started creating collars for smaller dogs after rescuing Sophie, an English bulldog. Zoob said finding fashionable collars and accessories for their “gentle giants” was a challenge for her family as the industry is geared toward dogs of small to average sizes. It led them to create their own products and the launch of the business’ online store in March of last year. The retail shop will be open from 11 a.m. to 7 p.m. Tuesday through Thursday, 10 a.m. to 8 p.m. Friday and Saturday, and noon to 5 p.m. Sunday. “(It’s) the best job I ever had,” Zoob said. With the addition of Real Big Puppy, the city’s economic development officials said 95 percent of downtown Delaware’s first-floor spaces are now occupied. Several new businesses have popped up over the course of the last year, including Olivina Taproom, Mohio Pizza, and Honey & Abernathy, all located along Sandusky Street, and Secret Identity Comics on North Franklin Street. Waiting in the wings is the Oak and Brazen winery, which may open this year at 38 E. Winter St., next door to the Strand Theatre. The wine production company and bar will occupy the first floor of the building that was once home to the Finish Line Bar and Grille about 12 years ago.